We used to celebrate Shrove Tuesday late as I was often too busy with work to stand flipping pancakes at the stove all evening. This year we had our pancakes 2 days early. We will probably have some for pudding tonight too. Everyone loves a pancake. Nothing unusual in the quantities in my recipe, just 125g of plain flour and a pinch of salt, then whisk in an egg, 300ml of milk and an optional tablespoon of melted butter. I usually make double those amounts though as that batch will only make 6-7 pancakes and we reckon to eat at least 3 each. I still find it hard to believe that there are ‘pancake mixes’ being sold in supermarkets. Surely if you ‘just add an egg and milk’ you are paying for a sachet of overpriced flour. 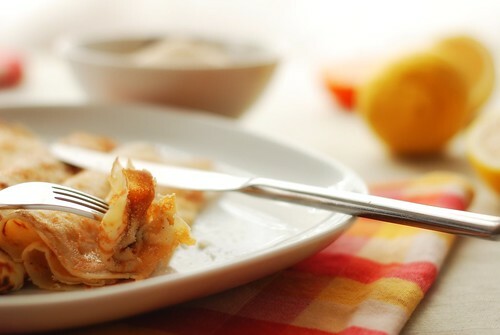 If you follow me on Twitter or read this blog often you will know that we eat pancakes quite regularly, and don’t just save the joy for Shrove Tuesday. We usually add to the calories and have them with bacon and maple syrup or balance the lard out with some fruit. 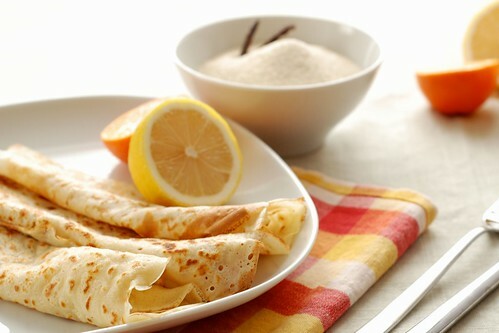 On pancake day though I go all purist and have them with lemon, orange and sugar. Luckily this Weekend there was enough light to photograph these in natural sunshine which hopefully means that spring is on the way. 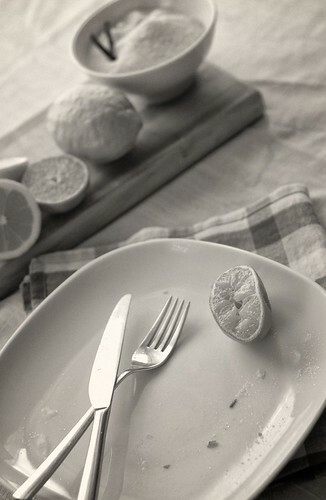 I did have to eat them after taking these shots…just to test them you understand. Enjoy pancake day, wherever you are. Shrove Tuesday came early in our house too, January actually!! My husband is very worried I won’t want to make more on Tuesday. These photos are lovely, very atmospheric. Claire, I love the pancake photos, really fantastic colours and light. We love pancakes in our house too. So yummy! What beautiful photos-not to mention the pancakes look absolutely delicious! Thank you! It is quite an old post, but still valid today. George loves a Weekend ‘fat’ pancake 🙂 UK Blogs are FULL of pancake recipes today.